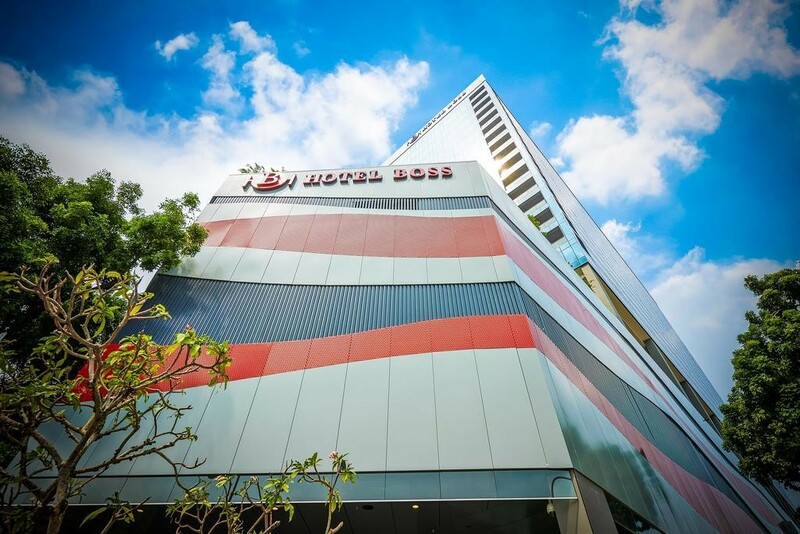 Located along Victoria Street, Hotel Boss offers accommodations in Singapore. It features an outdoor swimming pool and guests can enjoy meals from the 5 of the in-house dining options. Free WiFi is available throughout the property. It is 350 m to Lavender MRT Station, while the Malay Heritage Centre and Sultan Mosque are within 450 m away. The 24-hour Mustafa Centre is 900 m from Hotel Boss. Bugis Junction and Bugis MRT Station are 1 km from the property. Changi Airport is located 19 km away. Air-conditioned rooms are fitted with a flat-screen TV and an electric kettle. The private bathroom includes shower facilities, a hairdryer, and a hairdryer. Certain units open up to views of the city. Other facilities at the property include a fitness center and a children's playground. Guests can approach the 24-hour front desk for currency exchange, tour arrangement, and luggage storage. A business center is available. Nanjing Restaurant specializes in Huai Yang and Cantonese cuisine, while Founder Rou Gu Cha features Teochew-style fare. Jubilicious offers an array of halal fusion and local dishes..
With two queen size beds and a private balcony overlooking the atrium, the Family (Balcony) Rooms can comfortably accommodate up to 4 persons. The rooms are well equipped with modern amenities. *BBC World News, CCTV-4, Eurosportnews, FOX Movies Premium, FOX Sports News, STAR Chinese Movies, SuperSports Arena, TLC, Channel 5, Channel 8, Channel U, Channel NewsAsia, okto, Suria, Vasantham. Fitted with one queen bed overlooking the atrium, retreat to the elegance of contemporary designed Superior Double Rooms. Enjoy modern conveniences in the room for two. *BBC World News, CCTV-4, Eurosportnews, FOX Movies Premium, FOX Sports News, STAR Chinese Movies, SuperSports Arena, TLC, Channel 5, Channel 8, Channel U, Channel NewsAsia, okto, Suria, Vasantham. Providing simple comfort, our charming Deluxe Single Rooms are designed with the self-sufficient traveler in mind. Standard Double Rooms are equipped with a queen bed overlooking the atrium. *BBC World News, CCTV-4, Eurosportnews, FOX Movies Premium, FOX Sports News, STAR Chinese Movies, SuperSports Arena, TLC, Channel 5, Channel 8, Channel U, Channel NewsAsia, okto, Suria, Vasantham. Our Standard Single Rooms come with two single beds and are designed with the self-sufficient traveler in mind. Providing simple comfort, the room overlooks the atrium. *BBC World News, CCTV-4, Eurosportnews, FOX Movies Premium, FOX Sports News, STAR Chinese Movies, SuperSports Arena, TLC, Channel 5, Channel 8, Channel U, Channel NewsAsia, okto, Suria, Vasantham. Hotel Boss offers a variety of accommodation options that cater to the needs of modern business and leisure travellers. With 1,500 modern contemporary designed guest rooms and eleven room types, ranging from Standard, Superior, Twin, Triple, Family to Premier, you will be spoilt for choices. All rooms are equipped with complimentary high-speed WiFi access, internet-connected 40” LED TV with cable channels, USB charging port, electronic safe, mini fridge, coffee and tea making facilities, drinking water, hairdryer, dental kit and toiletries. Every 40” LED TV (IPTV) are connected to the internet, giving you the ability to surf, browse web content as well as stream HD YouTube with access to hotel information, guest services and getting around the hotel. To create a comfortable environment for our guests, smoking in the room is not permitted..